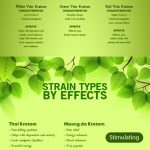 What are the Different Strains of Kratom? Have you ever tried different Kratom strains or you keep tasting the same strain over and over again? Some don’t even know that they are consuming different Kratom strains. It is better to have knowledge of what you consume and it is really necessary to learn about it. To my knowledge, there are hundreds of Kratom varieties which are currently available in the market and different people prefer different Kratom strain and everyone is happy consuming their own strains. So did you wonder when I said there are hundreds of Kratom strains, well there are not exactly 100 and they are much lesser than that as only a few Kratom strains make up for the entire varieties? To put them in a nutshell, to be specific there are only three Kratom stains which are white, green and red veins. So it is necessary to understand the functionality of each and every Kratom strain to get a better view of what is happening in the market once they are cultivated and picked up from the respective trees. When a Kratom vendor buys Kratom from a farmer who cultivates it, the name which is conveyed by the farmer is the name that will be used by the vendor and the vendor cannot name it differently all of his own. There are even suppliers who get stains from different farmers and mix them to produce a new variant and call it by using a different name in the end. For example, a new Kratom vendor buys Kratom from a farmer and mixes it with a product obtained from a different vendor and names it according to his convenience. So let’s get directly get into the type of strain that one should know about when it comes to the consumption. Well before saying that there are some guesses that are certainly doing the rounds and are believed by the people and they are the color of the white vein is obtained when the Kratom is excessively watered and if the Kratom is grown in a specific region it would get the green color and to obtain a green color the Kratom should be grown in a wild manner and all these explanations are not backed by any scientific explanation. When I sat down with a Kratom connoisseur named Johnny Clark and he explained that the green strain that we all consume is actually obtained from the red strain as the red strain is dried in a different way so that as a result of this process you will end up receiving a new strain as an output which is the green strain. He also said that these green strains are obtained by drying up them in an air-conditioned atmosphere and after that, they are dried by placing it outside for an hour. He also added that almost 70-80 percentage of the green and white strain is actually obtained from the red strain. A lot of process being involved in the different stages of the production of these strain and generally the white strain is obtained by fermenting it with the other strains. Other than this we came to know that there are various other factors which are involved in the production of these strains which are related to the type of soil, rain factor, and the external temperature plays a part in this. In general, if it rains, the color of the Kratom strain becomes in pale yellow color if the Kratom is from a rainy region. When you inquire this to the farmers you would certainly end up knowing that they produce only white, green and strains of Kratom. When you are witnessing a yellow variant of Kratom, then it is just a mixture of yellow and green Kratom variants. I suspect that by this time you would have known how the Kratom is getting the color. The red being one of the favorites for the people all over the world and it personally remains the best for me. The variant is grown mostly in the regions in southeast Asia and the red vein takes a lead among all the other Kratom variants by choice. The most significant thing about the red variant is that the ability of the vein to grow in all conditions. It can grow in a place where is water present at the knee level as there is a possibility of growth even in the dry conditions. The particular variant is also considered as the hulk of all other Kratom variants. Let me give you some examples of the pure red variants of Kratom. There are some of the Kratom at the purest level and you can find them at the stores. If you are a lover of potency, then this is surely a treat for you if you find a genuine supplier of this strain. It is one of the balanced types of Kratom variant where the Kratom has a mixed potency level and also capable of delivering the effects at a lower level when compared with the red strain. It is popularly called the middle of the road and the reason why it is called in this name is that it forms an intermediate to the white and red Kratom variant. It may or might not be the best choice for the users but still, it is not chosen as the last choice by the people who consume Kratom. It is also found that some users have found a sophisticated flavor that one feels after the consumption. The balance of Green Kratom does take an increment in its efficiency as a Kratom Extract. The extraction process may require further ingredients that all are natural. Vendors to sell Kratom extract are vastly available. The white strain Kratom powder still remains the other side of the Kratom leaf where the Kratom is considered at the last. This is also loved by a certain set of people who are fond of trying Kratom and who are very well understood the properties of the Kratom leaves. Mostly the white Kratom strain is not consumed alone as the Kratom is mixed with the red and green Kratom variants. If you are a new user of Kratom, you can slowly get used to the Kratom of this variant and I am sure that you will surely end up loving this beautiful variant of Kratom. Perhaps if you are on the verge of creating a new variant, you can use this particular Kratom variant to get the most desired results as the outcome. In the market, you can find many new different types of Kratom but in the end, it gets all boiled down to three types of a variant which is red, green and white. You can mix these variants with each other and call it according to the name that you wish.